Ravello is one of those impossibly romantic towns; almost like a set from a 50s Hollywood movie of how a small Italian town should look. With its lush and colourful terraced gardens, winding cobbled streets, and gently chiming church towers, it’s a sleepy dream of a town, and has seduced the likes of Wagner, D H Lawrence and Virginia Woolf with its charm. Tucked down one of these winding cobbled streets, commanding exquisite views from a clifftop position over 1000 ft above the sparkling Mediterranean Sea, is the pink-walled splendour of 12th-century villa Palazzo Avino. Though the home of Italian nobility for centuries, it has served as a hotel for just over twenty years, but with such smooth and effortless service that it feels like a much older establishment. Boasting Michelin-starred dining, elegant indoor and outdoor bar areas, a beautiful spa facility, fully-fitted gym, 20 metre outdoor heated swimming-pool, rooftop jacuzzi whirlpools, and private beach, it commands some of the finest views on the coast, but is far away from the touristy, sweltering bustle of the shores. 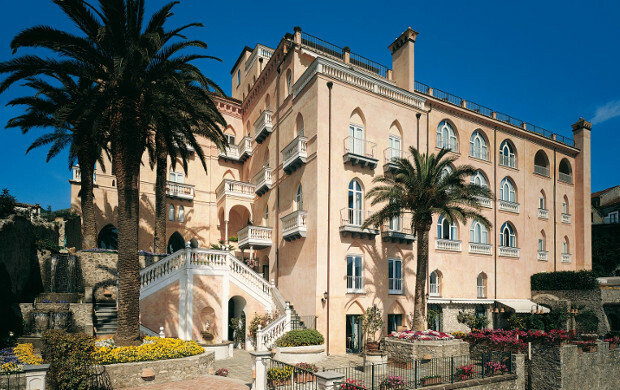 The Palazzo Avino boasts 33 bedrooms and 10 suites, and for our stay we were given an elegant sea view double. Light and airy, with huge double doors opening up onto a spectacular view of the hotel grounds with the mountains and sea stretching beyond, the room was decorated in an unfussy palette of cool white and deep teal, with carefully chosen 19th century style antique furnishings and rugs. Though not the ‘roomiest’ of rooms, the floor to ceiling balcony doors gave it the feeling of space, and the well-positioned armchairs in front of these made for an inviting spot to watch the sun go down. The bathroom was also a little on the compact side, but the bath products from perfumier Dr Vranjes—you can pick which scent you would like in your bathroom daily—were divine-smelling and generous. On arrival we were greeted by a free bottle of prosecco and a delicious chocolate cake (not to mention various other tasty morsels and treats that seemingly appeared by magic every time we returned to the room). When it comes to a nibble or a tipple, guests of the Palazzo Avino are spoilt for choice; for a casual light lunch—with an excellent selection of small plates and fresh pasta—there is the outdoor Terrazza Belvedere (with the addition of a Lobster and Martini bar that opens after 6pm) or for an unforgettable candlelit dinner there is the one-Michelin-starred Rossellini’s. When we dined at the latter we opted for the tasting menu, which took us on an unbelievable journey through the traditional cuisine of Amalfi as I’d never seen or tasted it before. The grilled scallops with pea puree, pods stock and lemon cream were a work of delicate art, the turbot with “Nocerino” spring onion, artichokes and Venus clams was the best fish dish I’ve ever eaten, and the chocolate brownie with mango jelly and coconut sorbet was simply dessert-lovers heaven. The excellent accompanying wine flight was proudly all-Italian and almost entirely local (and was more generously poured than is sometimes the case, unless they were just trying to get this critic drunk on purpose). By day Rossellini’s transforms into the breakfast terrace, with a view over the valley so majestic that the menu proclaims on its front cover “Breakfast by the Sky”. I’ve rarely had an “American breakfast” cooked so well as at Palazzo Avino, and the bountiful selection of all possible breads, cakes, fruits, yoghurts and fresh honeycomb (!) will more than set you up for the day. While we’re on the subject of all things tasty, special mention should also go to the Palazzo Avino’s two elegant bar areas; the splendid indoor Caffé Dell’Arte and outdoor Lobster and Martini bar, where you can order over 100 (!!) delicious bespoke martinis created by the Avino’s very own in-house martini mixologist. The Palazzo Avino has romance stamped all over it, and so is the perfect destination for honeymooners, couples on anniversaries, or well-heeled retirees. It feels like far too refined a venue to have big noisy families tearing round it, and its location away from the bustle of this touristy bit of the Italian coast makes it even more suitable for smaller parties. Anyone on the hunt for some serious peace and calm should find themselves more than at home. Ravello is famous for its terraced gardens, most notably the magnificent gardens of the Villa Rufolo and Villa Cimbrone, in which on a sunny day you can lose yourself for a few hours (though, as the sign somewhat aggressively informs you on entry, “NO PICNICS”). The former also hosts classical concerts during the summer, but out of season Ravello can seem a little on the sleepy side. Having said that, day-trips are easy to organise through the hotel; horse-riding, tennis, snorkelling, diving, kayaking, boat trips and even Italian cooking classes are all available through the concierge. 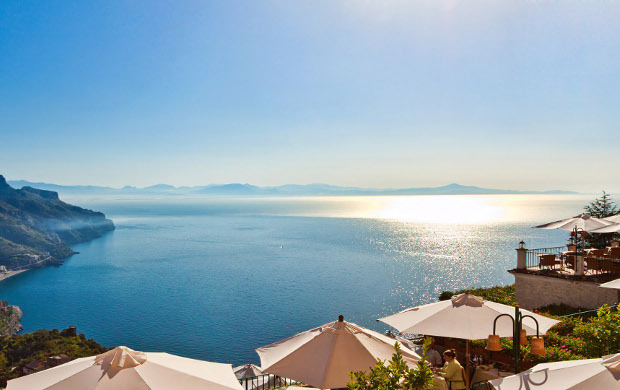 And with a bit of planning (and willingness to get up early) trips to historic Pompeii, Paestum and stunning Capri are all possible from the hotel. Unless you’re willing to fork out on a private car transfer, getting to (or journeying from) the Palazzo Avino isn’t the easiest endeavour. You can drive the winding hairpin bends if you’re feeling brave (Italian roads are famously twisty, and the Amalfi coast exemplifies that like nowhere else) but once you’re there parking isn’t plentiful and will cost you. There is a bus from Amalfi town, but nothing direct from any of the major cities, so it will either require meticulous planning or, as mentioned, a somewhat pricey private car. The breathtaking coastal view is just pipped to the post here by the Palazzo Avino’s exemplary staff. Our concierge Antonio gave fantastic recommendations on everything from local activities to our journey onwards, and the enthusiasm from all staff at the beautiful Rossellini’s as they took us through our unforgettable dinner was infectious. Palazzo Avino is family-owned and family-run, and that sort of love makes for an even warmer stay than the beautiful Italian weather! Rooms start at €308 per night (including breakfast) and suites start at €708 per night (including breakfast).